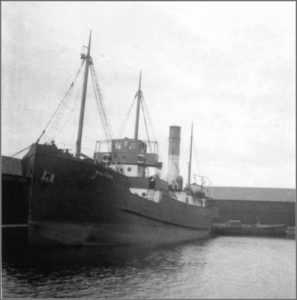 On the 4th July 1941 when on passage from Southend-on-Sea to Grangemouth with a cargo of sand, the SS Balfron foundered and was lost off Hyburn Wyke, north of Scarborough. She was a British Steam Coaster of 362 tons built in 1920 by Scotts, of Bowling, for The South Shield Steamship Co Ltd, managed by Walker & Bain, Grangemouth. 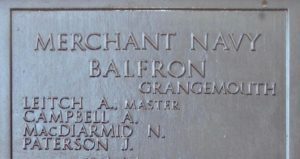 The Balfron was bombed and sunk when 3 miles off Ravenscar, after being attacked by German aircraft. Four of her crew, including her Master, Angus Leitch, went missing, presumed killed, and are remembered at Tower Hill Memorial (panel below). 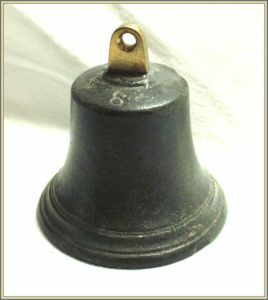 This un-named bell was found close by the wreck.